"GMackBey From Around the Way"
Is there anything better than jammin’ to all your favorite songs with your closest friends? The only thing that can possibly make that situation better is if you’re all belting them out at the top of your lungs. Whether it’s “Sweet Caroline,” “Don’t Stop Believin’,” or “Single Ladies” that you’ve just gotta hear, these versatile karaoke singers know all the great ditties of yesterday and today. And who knows… maybe they’ll hand over the mic to you and your friends so you can show off your golden pipes in front of the crowd, too! Karaoke has become one of the most famous forms of entertainment in the world. Generally Karaoke is performed by the guests and not a professional singer, but if you wanna leave it up to the professional, hiring a great karaoke singer is the perfect choice. A Karaoke Singer is a great alternative to a DJ or jukebox. Your guests can hear all their favorite songs from a great live singer. They can make requests and sing along all night long. Hire a Karaoke Singer for your next event whether it be a birthday party, corporate event, wedding reception or other special occasion. 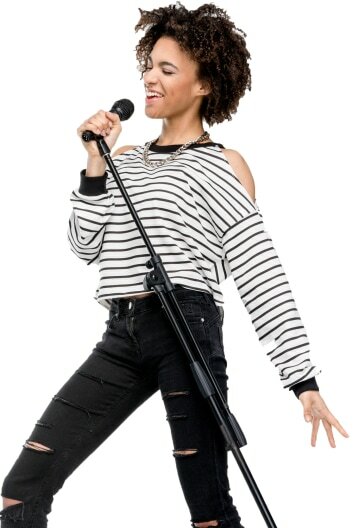 There are a few things you should do when hiring a Karaoke Singer. First, always listen to audio and watch video samples. This will ensure that you book the best for your special event. Also, be sure to review the singers set list and repertoire so you know that he or she will be able to perform all the hits you or your guests may request. Next, be sure to get a contract. Make sure to read this carefully and watch for specifications made by the singer. Last, as with any other purchase you would make, read reviews and get references. Talk to people in the area and previous clients about the performer and get feedback.